Prochem Shockaway is an anti-static treatment for carpets and other surfaces where static electricity build up is a problem. Prochem Shockaway leaves a non-sticky coating which conducts the electrical charge away from the fibre surface. Apply the product by sprayer to clean vacuumed carpet or hard surfaces. 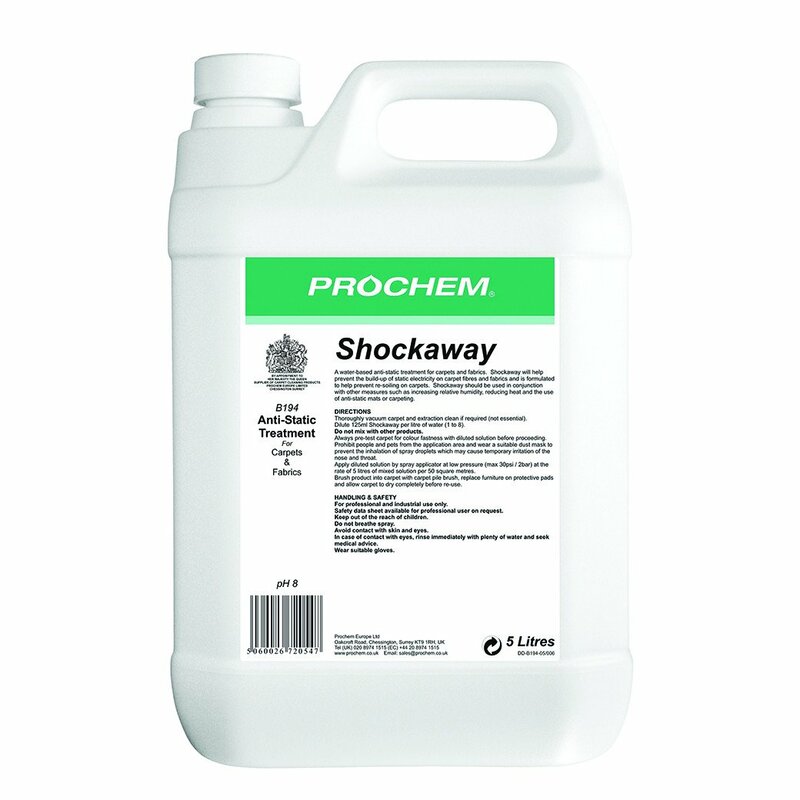 Prochem Shockaway is a clear liquid. Dilution ratio is 1 to 8, product pH 8 Prochem chemicals have a worldwide reputation for outstanding performance in the professional, commercial and institutional cleaning sectors. Specialist products cover a whole range of requirements for carpets, fabrics, floors and surface cleaning technologies and maintenance. Anti-static treatment for carpets & fabrics. Leaves a non-sticky coating which conducts the electrical charge away from the fibre surface. Apply by sprayer to clean vacuumed carpet or fabric. Coverage approx. 50m2 per 5 litres of mixed solution (450m2 per 5 litres of concentrate). Formulations are developed in-house to meet strict performance, safety, quality and environmental criteria. Prochem Europe chemicals are available from a network of selected distributors offering local supply, advice and training. Q. How long after application can the carpet be used again? A. The manufacturers recommendation is that you wait until the carpet is dry to touch. If traffic passes over the treated carpet while it is still damp then there is potential for the chemical to stick to shoes and leave patches with inadequate protection.